In the first part of this series about data storage on tvOS, we've discussed using NSUserDefaults and iCloud KVS on tvOS. 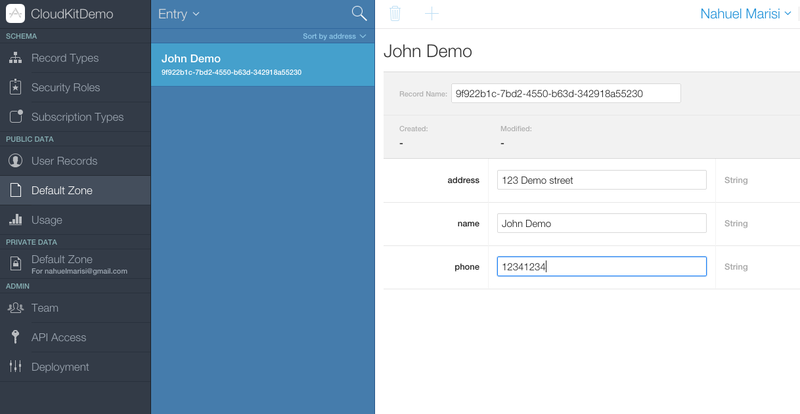 Today we're going to go through a very brief introduction of CloudKit. As we discussed before, the Apple TV has rather limited local storage space. If you plan to store a significant amount of data (according to our Apple overloards that means more than 1 MB) you might want to check out CloudKit. The information about CloudKit is not tvOS-specific, so it should still be useful to you if you're working on an iOS or Mac app. The idea of this post is to briefly describe CloudKit's main features and workflow so you can then go on your merry way and try it out. So what is CloudKit and why use it? In the likely event that your app is an overnight success, you can go and purchase more storage to cover your ever-growing needs. It's worth mentioning here that CloudKit does not make use of any of the user's iCloud storage. In a sense, it's separate from iCloud. It only uses the user's existing credentials for authentication. Naturally, you first need to enable the CloudKit entitlement on your project. Go to the target preferences and click on the 'capabilities' tab. Turn on iCloud and then select CloudKit. This will create a default container for you as well. You might be wondering, what the heck is a container?! Well, a container keeps your app's records on the server. It's essentially a grouping of databases. You might have there a public database that is shared and a private one which is user-specific for example. 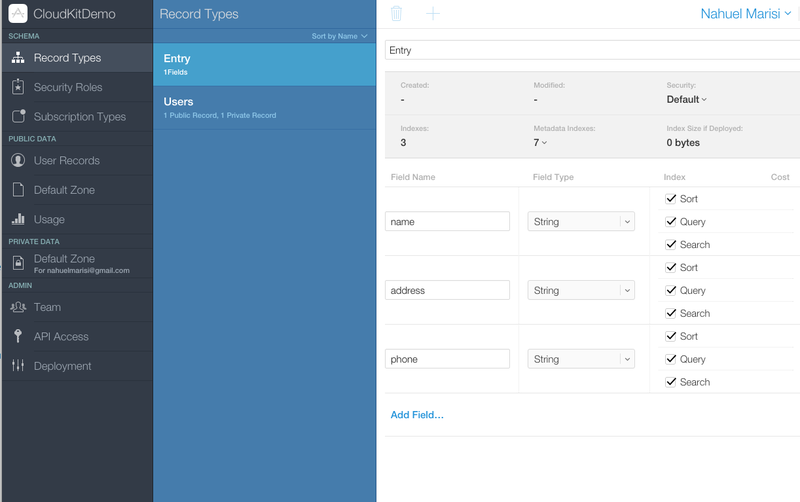 The dashboard is where you'll be creating the records that your app will be using. 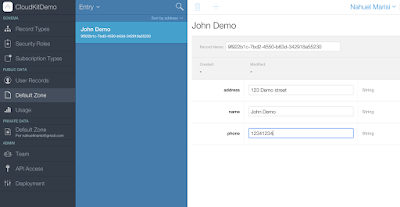 You can click 'CloudKit Dashboard' in the capabilities pane to go straight to it. You'll see 'Record Types', 'Security Roles' and 'Subscription Types'. In this post we will only deal with record types. If you've used other BaaS before you might be familiar with these concepts. 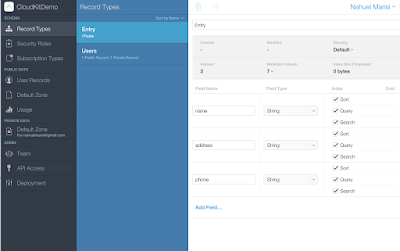 If not, you can think of a record like a model class in your app. Essentially, a record type is a set of fields of various attributes. A record is an instance of a record type. For example, if we had a phone book app, we might have a record type called entry that contains the fields name, address and phone number. To create a new record type, select 'Record Types' under 'Schema' and then press the '+' button. In order to fetch records, we must first retrieve the public database in our container. In our case we're using the default container. We need to create a CKRecordID object with our record name. We then call the fetchRecordWithID: method with our CKRecordID object. Fetching by predicate is very similar to fetching by identifier. The main difference being that we must create an NSPredicate object that we can then use with a CKQuery object. We then use our query object to peform a query on our database. Downloading data is all well and good, but what if you wanted your app to update the fetched records and send the changes back to CloudKit? Luckily for you, this is quite easy to achieve. Each record is represented by a CKRecord object. It has the standard methods setObject:ForKey:, objectForKey, allKeys and changedKeys, you can use to update or add new fields. Once you're done with your changes you simple call saveRecord:completionHandler: on your CKDatabase object. If you've retrieved the record previously, any changes will update the version stored on CloudKit. If you've create a new record, a new entry will be created instead. Interestingly enough, if you set values for keys that were not originally defined in your entry, they will be added to your entry by CloudKit. This is a nice and easy way to change an Entity without having to go through CloudKit's dashboard. First we retrieve the database, in our case this is just the public database in the default container. We create a new CKRecord of type Entity and set the values for all the keys. Note that we've added a new key we hadn't defined in CloudKit's dashboard, that of "Private Detective". We save our new record, and if all goes well the callback will return the saved record. We can now see our new record on CloudKit's Dashboard together with its new field, which is now available to all Entry objects. The idea of this tutorial is to show you the basic workflow so you can decide if CloudKit is useful for you. The bottom line is that CloudKit is a sophisticated BaaS run by Apple. If your app is exclusive for tvOS or iOS devices and it requires a fair amount of storage in the cloud, then you should definately check CloudKit out.